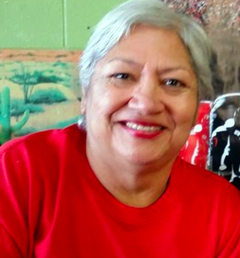 Maria Eva (Cardenas) Ramirez, 64 of Lubbock was ushered into heaven to be with her Lord and Savior on September 16, 2018. A celebration of life will be on Saturday, September 22, 2018 at Broadway Funeral Directors at 11:00 A.M.
Eva was born to Juan Cardenas Sr. and Concha Soto on January 25, 1954. She married Armando Ramirez Sr. on Dec. 31,1974. Eva worked in the medical field for 31 years at Covenant Lakeside. Eva had a zeal for life. She loved traveling and sightseeing. She enjoyed spending time with friends & family. She enjoyed going to events far and near. Eva was a selfless and humble person, the type who would give the shirt off her back to help anyone. Never seeking fame or fortune, she loved people and life and lived it to the fullest. Eva will be greatly missed by all who knew and love her. Those left to cherish her memories are the love of her life, Armando Ramirez Sr., one son, Armando Ramirez Jr. of Lubbock, one brother, Dee Cardenas (JoAnn) of Lubbock, 6 sisters, Teresa Castro (Abel), Josie Caballero (Louis), Bobbie Hernandez (Ralph), all of Lubbock, Sue Castro of San Angelo, Sophia Meltzer (Ted) of New York, and Betti Cardenas of San Antonio. The family would like to extend their sincere gratitude to the nurses and doctors of Beyond Faith Hospice of Lubbock. The compassion and loving care you shared with our sister was phenomenal. Thank you to Dr. C. Jackson ALS specialist and her San Antonio staff for their tremendous care and support. A special thanks to Lea Ann Rodriguez for her extraordinary care during Eva’s journey. Per Eva Ramirez’s request~Please no flowers.